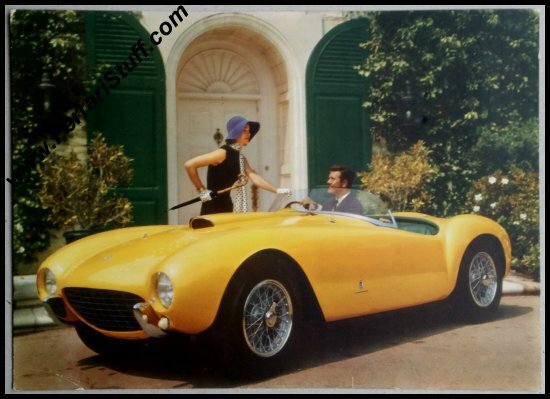 1954 Ferrari 375 MM Spider Sales Brochure Merritt 117 in English. 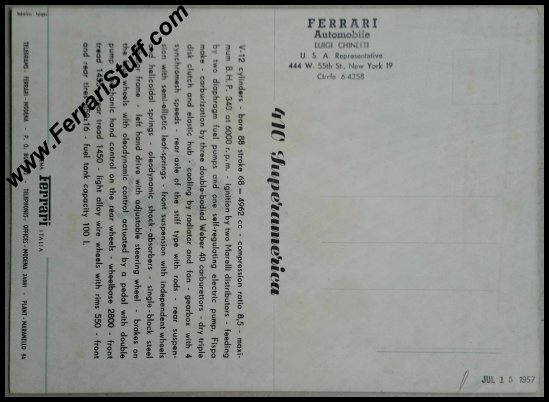 This is an original 1954 oversized postcard / sales flyer for the Ferrari 375 Mille Miglia as listed in Richard Merritt's book on page 117 - 118. 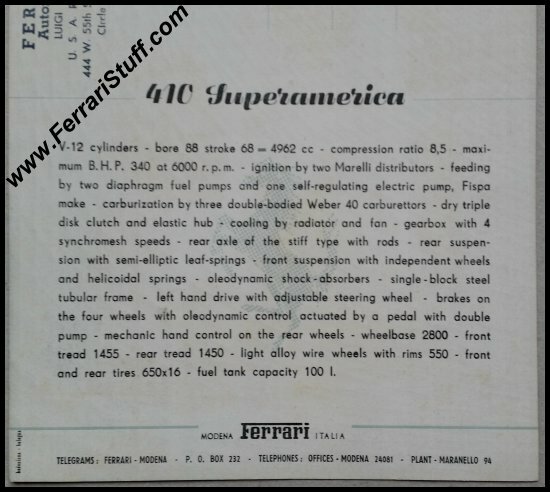 The front shows a great shot S/N 0460AM (believed to be the oldest Ferrari still in the hands of its original owner / family) while the rear falsely shows the caption "410 Superamerica" along with the specs in English. 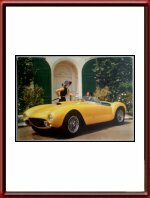 This fantastic Ferrari 375 MM Farina roadster, number 0460-AM, (and here mis-named as a 410 SA), is still in the hands of the original owner and looks this nice even today. It is felt that the specifications, which show data for a 410 version, indicate an intention at the time to produce a small series which failed to materialize. 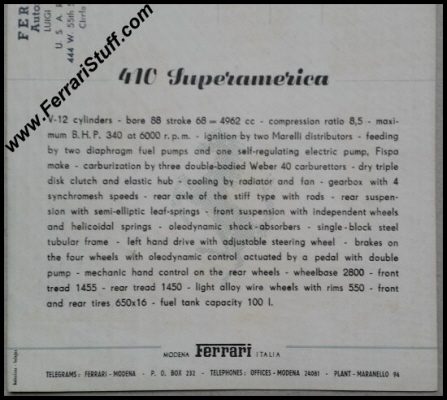 The only major difference between the 375 and 410 engines was the increased bore, from 84 to 88 millimeters. The fitting of front bumperettes perhaps would indicate that this car was intended primarily for normal street usage. However, there are no provisions for windshield wipers, a top, or easy entrance for the elegantly dressed lady. As visible in the photos, it carries the stamp of Luigi Chinetti on the back as well as a date stamp (JUL 15 1957). It is in a more than excellent condition for its age and is a rare opportunity. 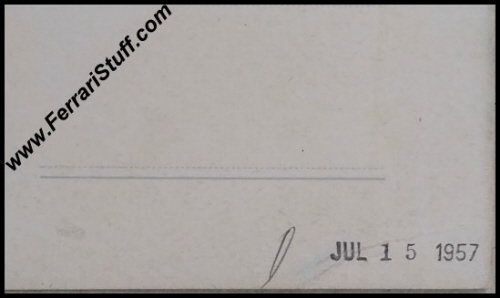 The photos are of the actual card up for sale so please be your own judge on its condition. It measures approximately 21 x 15 cm or some 8.5 x 6 inches. Merritt reference: Pages 117 + 118. We only have 1 available of course.